Dr. Jared Heinz was raised in Berks County and attended Wilson High School. Dr. Heinz graduated from Penn State with a Bachelors' of Science degree in Science. After attending Penn State, Dr. Heinz moved to Davenport, Iowa where he attended Palmer College of Chiropractic. 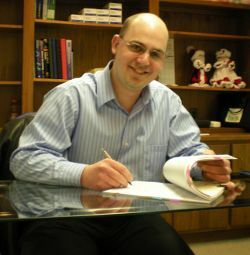 Dr. Heinz graduated from Palmer College with honors in 2006. The doctor continues to reside with his wife, Dr. Ann Lee in the Berks / Lancaster County area and enjoys many hobbies such as archery, fishing and community activities. Dr. Heinz is a member of Advent Lutheran Church in West Lawn, PA. Dr. Heinz is also an associate board member of Riverfront Federal Credit Union and has also taught anatomy as an associate professor at the Penn State Berks Campus. Dr. Lee is a naturopathic doctor and acupuncturist at Health For Life Clinic, Inc. in Lancaster, PA.
© 2009 Heinz Chiropractic, LLC.